Under Armour® Performance Enhancing Sports Guard. The Under Armour® (UA) Performance Mouthguard offers superior protection in addition to performance benefits! Whether you perform in contact sports like football, hockey, and lacrosse… or compete in endurance-draining sports like running, soccer, baseball or golf… This sportsguard is for you! Whether you’re in competition or just training, the UA Performance Mouthware helps your body perform better. The UA ArmourBite™ Technology prevents your teeth from clenching and pivots your jaw forward to relieve pressure on your TMJ (temperomandibular joint). As a result, your body produces less negative (performance-degrading) compounds like cortisol and lactate during your activity. The UA sportsguard has been shown to increase strength performance by 17%, reduce lactic acid build up by 25% , improve airway flow during exertion, speed up reaction time, and improve endurance for athletes under intense exercise. The UA Performance Mouthwear is backed by multiple studies, peer-reviewed journals and many professional athletes, pro trainers, strength coaches and wellness experts. Contact us to learn more and find out which UnderArmour Mouthguard is right for you! ProForm guards are prescribed for both professional and amateur athletes because they offer the highest level of protection, retention, comfort and fit, without interfering with speech or breathing during play. 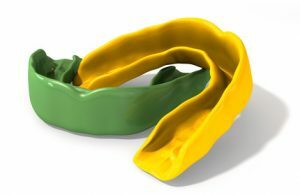 ProForm has the advantage over boil-and-bite types of mouthguards because of their superior fit and retention. In addition, ProForm mouthguards are thin, comfortable, custom fitted and will retain their shape long after other mouthguards have worn out.